As the Fall TV season is about to start, many new and returning shows are starting to advertise their programs, including Hawaii Five-0 on CBS. And in this house that means – dog singing! 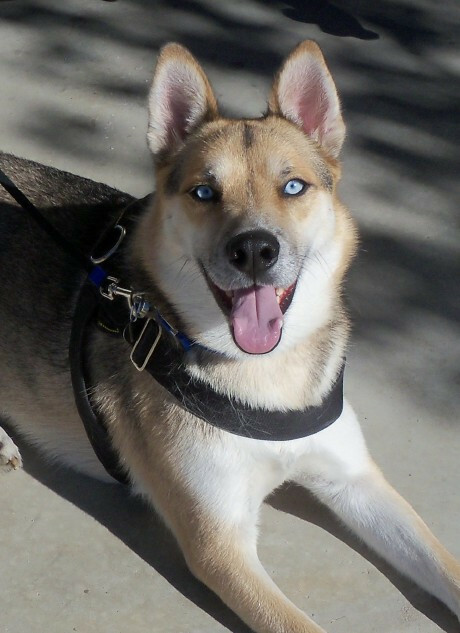 About a year and a half ago, my rescued half German Shepherd/half Siberian Husky Dakota B. Dog found his voice for the first time. I sat down to watch an episode of the TV show set in Honolulu, but as soon as the opening credits and that well-known theme song began, I heard something new. It was the sound of my dog howling for the first time. Er, I mean “singing”. Since then, he ALWAYS sings along when this theme song is played – whether while I’m watching the show, or an ad for the show comes on (like it’s been doing a lot lately! ), or even when I just want to see if he’ll give a little singing performance for company. But his repertoire has expanded a bit. He’ll now also howl-sing along to various other commercial themes and (for some reason) to the CBS network news theme music. There’s no rhyme or reason for it, but it sure is fun. And when he’s done, he just lays back down – probably to dream of visiting the islands someday. Ha! Here’s a link to a story I wrote recently about saving money on lodging in Hawaii. Do you have some ultra talented pets too? Share your story or a link to a video! Ha! I’ll be sure to tell him. So glad the video came up for you. Any requests for the next song he should learn? *laughs* Nan first played the vid in bed on her iPhone – 3 of us were in the bedroom with her and when Dakota started singing we started barking and took off out of the room looking for the intruder dog! She has played it many times since and it always gets our attention *chuckles* #Aaaarrrrooooooooooooo ! !